b>This review and others are posted at Inspiring Insomnia. Prep School Confidential, the first book in this series and the first book by Kara Taylor, was such a fun and dark surprise. Fun because of Anne, the unforgettable narrator, and dark because the cute cover gave no hints of the evil that awaited Anne at her new boarding school. When her roommate, Isabella, was murdered, Anne made it her mission to unmask the murderer and those responsible for the resulting cover-up. When Prep School Confidential ended, Anne had discovered a much older and completely unrelated conspiracy that she becomes just as determined to solve. 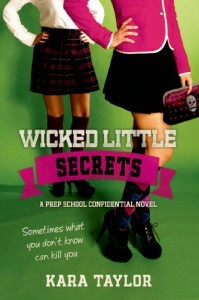 In Wicked Little Secrets, Anne investigates the death of a former student, Matthew Weaver, who had ties to the parents of several of her classmates, including her boyfriend. I was a bit worried that the mystery of Matthew’s death would be less intriguing than Isabella’s death, since it lacked the same sense of urgency and the connection to Anne. But as Anne pushes on, the mystery wraps up more and more of Anne’s classmates, and the danger comes closer to Anne as she gets closer to figuring out whodunit. There is a love triangle in Wicked Little Secrets, but…wait for it!…it is handled perfectly. 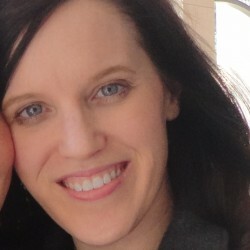 Brent is Anne’s classmate and boyfriend, and Anthony is Isabella’s brother with whom she also shares a strong attraction. Both of the relationships feel so real. Neither guy is the ridiculously unbelievable “I’d die for you, and I’ll kill myself if I can’t have you,” type that is found all too often in YA love triangles. I hesitate to even call it a love triangle because that term brings to my mind things like weeping hysteria and collapsing to the floor with grief after a minor tiff. But all of that is absent here. Yes, Anne quarrels with both Brent and Anthony. Yes, she cries. But they all behave like typical teenagers who have identities separate from their romance, and it is not the focal point of the story around which everything else revolves. I cannot adequately express how refreshing this is, and I’d even go so far to say that this is reason alone to read the book. Anne is one of the most memorable female protagonists I’ve come across in a long time. She’s forceful without being obnoxious. She can be careless and reckless and frustrating, but her heart is in the right place. And she does NOT give up. She’s the kind of girl I would have loved to have been friends with when I was a teenager, even while I was wishing that I could be a little bit more like her. Note: I received an ARC from the publisher in exchange for an honest review.